This delicious jalapeño macaroni and cheese takes the classic macaroni and cheese casserole to a new level. The recipe calls for some Boursin cheese, but it may be omitted or replaced with about 3 to 4 ounces of cream cheese. Or add some extra cheddar or cheddar jack cheese to the sauce. Use only half of a can of chopped jalapeño peppers if you'd like a milder mac and cheese, or use mild green chiles or a combination to replace the jalapeños. Finely minced fresh jalapeños may be used as well. For more heat, add some pepper jack cheese along with the cheddar! Ditalini was used in the pictured recipe, but elbow macaroni, shells, or mini penne pasta would work well, too. Cook the pasta in boiling salted water following package directions. Drain and rinse; set aside. Gradually add the milk, or half-and-half, and Boursin cheese. Cook, stirring, until hot and thickened. Add the cheese and peppers. Continue cooking until the cheese has melted, stirring constantly. Add salt and pepper, to taste. If necessary, thin slightly with extra milk. Combine the sauce with the pasta and stir to blend. Spoon into prepared baking dish. Toss melted butter and bread crumbs together until the crumbs are thoroughly coated; sprinkle over the casserole. Bake in the preheated oven for about 25 minutes, or until bubbly and lightly browned. 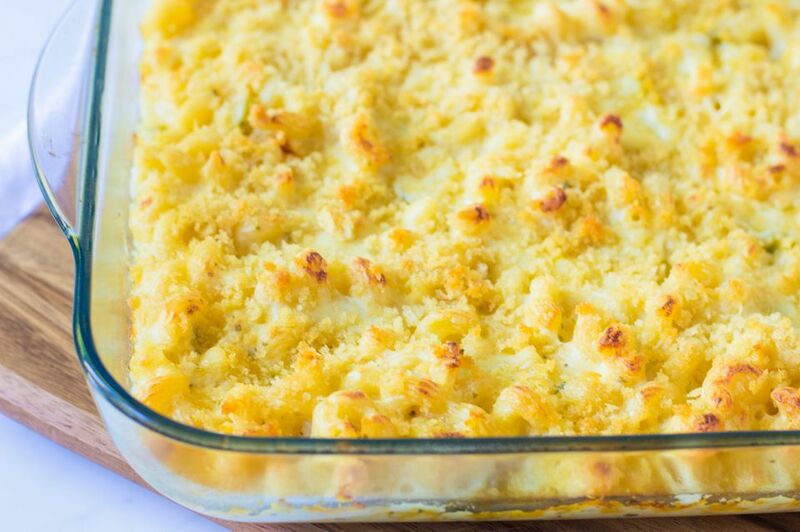 Scoop the mac and cheese onto serving plates or bowls and enjoy! Jalapeño peppers are relatively mild when compared with other hot chile peppers, but the heat intensity can vary somewhat. Add as much or as little as you like, or substitute milder chiles for all or part of the jalapeños. When working with fresh jalapeño peppers, wear gloves and don't touch or rub your eyes. Remove the stem end and slice a pepper in half lengthwise. With a spoon or melon baller, scrape out the seeds and lighter colored pith and ribs. Mince the peppers finely and use in the recipe. Put your stale bread in the food processor and make fine or coarse breadcrumbs. Freeze the crumbs in bags—labeled with name and date—and you'll have breadcrumbs whenever you need them. Use shredded pepper jack or a Mexican blend of cheeses instead of the cheddar cheese. To substitute for the Boursin cheese, combine 4 ounces of softened cream cheese with 2 tablespoons of softened butter. Season with a dash of salt and pepper, 1/2 teaspoon of garlic powder, and 1 teaspoon of chopped fresh herbs—or 1/2 teaspoon of dried herbs—if desired. Instead of elbows, use ditalini, mini penne, cavatappi, or another kind of small tubular pasta.